Eden City Kharar is upcoming Premium residential group housing project Aerocity IT city on international airport road by Sehaj Group of companies. Options of 3 BHK + utility | 3 BHK + Store | 2 BHK + Utility and pent houses luxury flats / villas are available with best in class amenities and infrastructure. 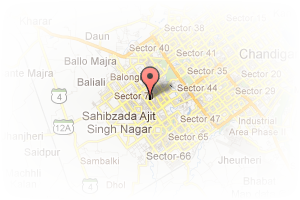 Address: Near By Football Stadium, Kharar, Mohali, Chandigarh, India. This Builder Profile page for "Sehaj Group Of Companies" has been created by PropertyWala.com. 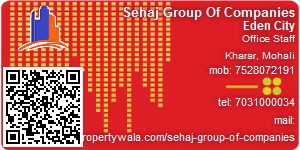 "Sehaj Group Of Companies" is not endorsed by or affiliated with PropertyWala.com. For questions regarding Builder Profiles on PropertyWala.com please contact us.